Hungarian paprika is stronger and richer than Spanish paprika, which is quite mild. Through controlled breeding, however, the plants take on a sweeter, lightly pungent flavor with a faint bitter aftertaste. 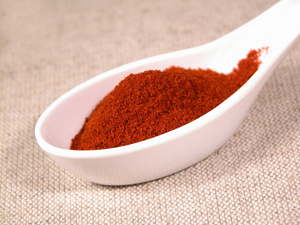 Paprika is made from the dried, ground pods of Capsicum annum, a sweet red pepper. It is mildly flavored and prized for its brilliant red color, although the powder can vary in color from bright red to rusty brown. Like all capsicums, the paprika varieties are native to South America, where it was originally a tropical plant. Today, Hungary and Spain are the two main centers for growing paprika peppers, though these varieties have evolved into much milder forms than their tropical ancestors. Hungarian paprika is stronger and richer than Spanish paprika, which is quite mild. Through controlled breeding, however, the plants take on a sweeter, lightly pungent flavor with a faint bitter aftertaste. To maintain the stronger taste consumers have come to expect, some spice companies add cayenne to heat up Hungarian paprika. Paprika is an emulsifier, temporarily bonding with oil and vinegar to make a smooth mixture for a salad dressing. Commercial food manufacturers use paprika in cheeses, processed meats, marinades, smoked foods, tomato sauces, chili powders and soups. Many Spanish, Portuguese and Turkish recipes call for paprika in soups, stews, casseroles and vegetables. In India, paprika is sometimes used in tandoori chicken to create its characteristic red color. In fact, if a food item is colored red, orange or reddish brown and the label lists “natural color,” paprika likely provides the color. Fresh red peppers have more than seven times as much vitamin C as oranges, but the high heat of modern drying processes destroys much of the vitamin C in paprika. It is, however, an excellent source of beta carotene, which the body converts to vitamin A.
Paprika deteriorates quickly, so it should be purchased in small quantities and kept in airtight containers away from sunlight or heat.